In today’s world of constant transition, the most valuable managers are those who are able to effectively lead transition. Organizations still need managers who can manage quality, process and consistency, but the career edge goes to those who can contribute to creating the future. As the Manager approached the front of the room to begin his presentation on the upcoming changes that were about to occur in the department, his moist palms and dry throat gave testimony to a sleepless night. At the heart of his stress was an uncertainty as to whether in the previous months he had made enough deposits in a number of relational bank accounts to carry the day. His anxious audience sat in preoccupied silence—their thoughts consumed with visions of layoffs, loss of status and financial insecurity. Welcome to the world of leading transitions. Today, organizations and individuals continue to look for insight to guide their judgement and actions in response to dramatic advances in technology, communication, media, markets and just about everything else in life. Change is now constant. In both public and private sector organizations, change is often driven by a financial or commercial imperative. Change is usually managed from the top with an emphasis on structures and systems that will deliver economic value. Sometimes change is driven by a broader desire to develop organization capability, where the emphasis is on bottom-up participation that requires facilitating leadership and an emphasis on culture and organization behaviour. 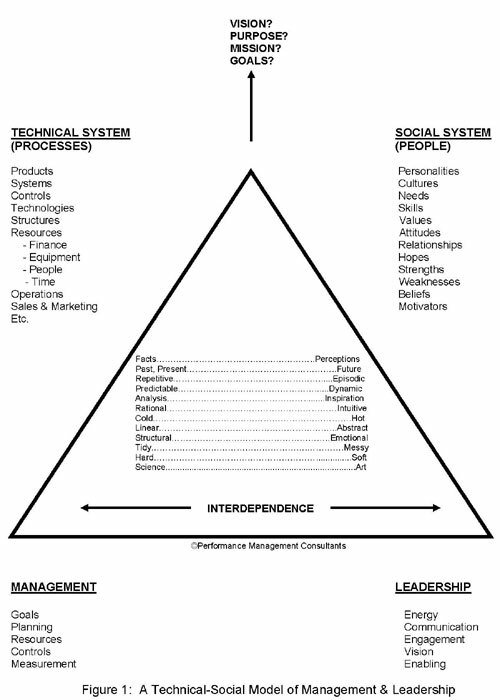 In either of these scenarios, organizations often focus on the “Technical System”—the complex array of structures, processes, controls, products, services, and technologies, while paying lip service to the “Social System”—the even more complex system of people, personalities, needs, expectations, and relationships. Without serious leadership and an organization development focus on enabling the Social System, sustainable change is unlikely. In a for-profit environment, it could be argued that the only sustainable competitive advantage that one organization has over another is its ability to adapt or change more quickly than its competitors. In the not-for-profit or public sector the ability to adopt and realign to new directions is also fundamental to the achievement of new goals or the effective implementation of policy initiatives. As the futurist Alvin Toffler observed in “The Third Wave”, in the face of constant change we either learn to adjust and embrace change or we spend an increasing amount of time in pathological regression looking for our private place of security and insulation from the reality and challenges of change. To a degree our response is dependent on our pre-disposition of personality and our sub-conscious conditioning and learned behaviour which guides most of our emotional responses. Paradoxically, as a species, our survival has depended on an incredible ability to morph to ‘survival mode’ when needed. At a personal level, most of us enjoy the comfort of the known and become stressed when our assumptions of security and order are challenged. The Holmes-Rahe stress diagnostic tool which predicts the possibility of stress-related illness is built on a model which accumulates scores for various life event changes that one may be experiencing at any point in time. The cumulative affect of change takes its toll on all of us. Many psychologists would suggest that in an evolutionary sense we are not physiologically built to cope with the pace of change that challenges us all. The manager’s (Manager, Supervisor, Team Leader) role in transition is critical to both success and survival in today’s world. Strategies are intellectually simple; their execution is not. At the end of the day you bet on people, and the capability of managers to lead people through transition is at the heart of effective transitions. The role of the manager cannot be over-emphasized in a change scenario. In their book, “Execution—The Discipline of Getting Things Done,” Larry Bossity and Ram Charran state that the vast majority of strategic initiatives fail due to a lack of management engagement and involvement at the operational level—at the point of execution. The suggested behaviour framework that follows reflects the life cycle of possible transition. It starts with self-management, moves to enabling others, and then managing communication and building commitment to a new future. It is worth considering some of the specific skills, behaviours and attitudes (competencies) that define exceptional transition leaders. Facilitating change presents a tremendous opportunity to differentiate oneself and to demonstrate one’s skills and leadership capabilities in the testing crucible of transition. We live in an age where intellectual horse power, creativity and engaged people create the future in all spheres of life. It takes enlightened leadership to guide others in this quest for a better tomorrow whether in science, industry or government. The challenges of transition offer enormous opportunities for personal and professional development. In the many conflicting needs relating to stakeholders, economics, process, staffing and related issues, he knows that he is committed to the “common good” in a spirit of justice and fair play. Who better to lead transition?